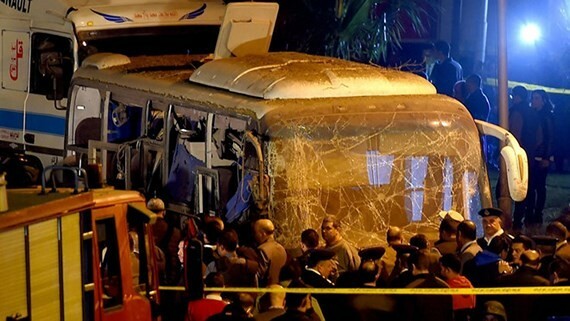 Egypt bus attack victims receive a maximum life insurance benefit of VND2.4 bil. A tourist who killed in bomb attack in Egypt will receive the maximum life insurance coverage amount of VND2.4 billion (US$103,000), announced Bao Viet Insurance Corporation who is responsible for paying victims of the blast. The company will also pay to injured victims a sum of money based on treatment fees, up to a maximum of VND2.4 billion. First nine Vietnamese victims of Egypt bomb attack came back home. Three people are being treated in hospital in Egypt. Four people have been killed, including three Vietnamese tourists and an Egyptian tour guide, and another 10 injured in a roadside bomb exploded near the bus carrying visitors close to the pyramids in Giza at 18:15 of December 28 (local time). There were 18 people on the bus at that time, including 15 Vietnamese tourists and three Egyptians. Saigontourist Travel Service Company whose customers were killed and injured by the bomb blast sent a group of employees to Egypt to support Vietnamese victims and implement emergency measures to help its guests.